I never do this! Despite having given countless sermons and talks over the years, I don’t add them to my blog. I preached this on Mothering Sunday morning 2015. I found it difficult to write and very hard to deliver. Now I know why. I knew when preparing there was something very ‘wrong’ with me but had no idea what – I had 6 more months to wait for my PND diagnosis. When sharing it I longed for the ‘girl I used to be’ to return . As I was speaking I felt a panic attack begin. I had NEVER experienced this before, standing in front of 100′ s of faces has been my ‘bread and butter’ for years! Anyway, here is it…. “As it’s Mothers Day, Hilary asked me share honestly, what becoming a mum has been like, and the impact it has had on my faith. The best word I can use to describe the last 18 months, since Reuben joined our lives, is CHANGE. If you are a parent, you will know that the minute your little bundle enters the world, everything changes. To be honest, I found the amount change, that seems to get to every part of your life, very difficult to cope with. But there are two areas where I found the change almost impossible to bear. Firstly, the changes that happened internally – that went right to core of who I believe I am. And secondly, the change I saw in my faith. I felt far from God, far from myself and with no idea where I was headed next. I remember saying to myself “my faith hasn’t failed me, I have failed it”…or perhaps what I meant was “God hasn’t failed me, I have failed him”. All of that of plunged me into months of darkness, of questioning, of tears, of feeling alone, frightened, lost and without purpose. Because of that, I have struggled with what to share this morning. Hilary asked me to share because it’s Mother’s Day, but based on what I’ve just said you might be wondering if I have anything helpful to say about Motherhood, especially on a day when we should be celebrating it! I have chosen to share from Isaiah 43. Rather than focus on my experiences of Motherhood, I want to share with you who I have found God to be during these last 18 months, when becoming a mum, and some reminders I have needed from God, where my faith is concerned. They are simply truths, I probably won’t share anything you don’t already know, but they have been a great comfort and encouragement to me, and have helped shift my focus off myself and onto God. I also acknowledge, while this is Mother’s Day, not everyone here is a mum, even for the very simple fact that large percentage of you are male! But I hope that all of us will be encouraged and challenged, as we look at God’s word together. In reading Isaiah 43, we hear God, through his Prophet Isaiah, speaking to the nation of Israel – Judah – who are in exile. These people have been ripped from their homes, by the Babylonians, and taken to a new place to live. It’s hard to put ourselves in their shoes, to imagine what it must have been like – but they have been stripped of everything that was familiar and important to them, they have lost their home and probably most of their personal possessions. Family, friends and neighbours could have been separated in the move. They have lost their identity, their temple, and perhaps worst of all their trust and relationship with God. They are in a difficult and desperate situation – everything they once knew is gone and the only thing certain is that everything has changed. Through Isaiah, God speaks words of comfort, hope and encouragement to His people. Words that they desperately needed to hear. Truth that they absolutely needed to be reminded of. We hear God remind Israel that He created them, they began with Him – they were His idea. He says He has called them by name and that they belong to Him. If we were to read further on in the chapter, we would hear God tell Israel that He has chosen them and that no one can take them from Him – nothing is going to change who they are. It doesn’t matter what life might look like right now, it doesn’t matter what Babylon might say about them, or try to do to with them – they belong to God. They are His. I recon, that’s exactly what Israel needed to to hear. In the midst of mess they were facing, they needed God to declare who they were. As I have read the passage, it’s exactly what I have needed to hear too. In becoming a mum it seemed like my whole identity and purpose changed overnight. I felt like life as I knew it was ripped from me. I went from being independent to having someone else absolutely dependent on me for everything. I went from being productive and useful in a job I enjoyed, to being at home, alone with no clue of how to be a mum and feeling like I was failing every time I tried. My appearance changed my figure gone, my clothes fitted me differently and my hair was falling out. As I looked in the mirror I didn’t know who was look back at me – internally or externally. That overwhelmed me . So just like Israel, I needed God to tell me who I am – not the mirror and not my emotions. I needed to hear Him say that I am created by Him, that I belong to Him, that He has chosen me and called me and that nothing (not even becoming a mum) could change that. I can’t tell you the hope that comes from being reminded of that. Nothing in my change of circumstances changed my spiritual DNA – I belong to God. I don’t think I am alone in questioning my identity, when becoming a Mum. I don’t think it’s the only time is my life, I will be faced with it. In fact, if there is one common struggle, we all wrestle with, at some point in our lives, it’s the question of “Who Am I?”. The reminder from God this morning is that we are not defined by whether or not we have children; our relationships with others; our jobs; earnings; personality; appearance or any other credential we could come up with. God says we are defined by the fact that we belong to Him. We find our true identity and reason for being, in the truth that we are His. Israel were facing troublesome days – living in exile, under the authority of another nation, life was not easy. They knew it and God knew it. God doesn’t pretend otherwise, He acknowledges that trouble is their reality – deep waters, rivers of difficulty and fires of oppression are the order of the day. But notice where God is, when all of this is surrounding them? He says “I will be with you”. God declares, that during their depths of despair, He is in right in the middle of it with them. Israel knew they were in difficult days, I guess they probably knew their situation would get worse before it would get better. But what comfort to hear that they were not alone in it, as they might have feared. The God who created them, was in it with them. I have questioned God’s location many times over the last 18 months – I have felt further and more distant from Him than at any other time in my life. I have guilted myself with the belief that I had left Him, and mourned the idea that He may have parted from me. Thankfully neither of those were, or are, true. God has been, is, and will always be with me. There have been days that it has been hard to believe that, but even in those times, God had not left me – He was right in them with me. It’s easy to look at our circumstances, much more so when they are difficult, and question where God is, or wonder if he’s there at all, isn’t it? Perhaps you understand that this morning, because you wonder if God has left you of forgotten you, in all that your facing. Maybe you are ‘putting a brave face on it’ so no-one else will know that you are questioning your faith in that way. If you are wondering this morning, just where God is, He says very clearly…”I am with you”. No matter what you feel like this Mother’s Day morning, no matter what you are facing, the truth of God’s presence with you cannot be changed. This is my favourite verse in the whole of the passage. God could not be any clearer about how He feels towards Israel. 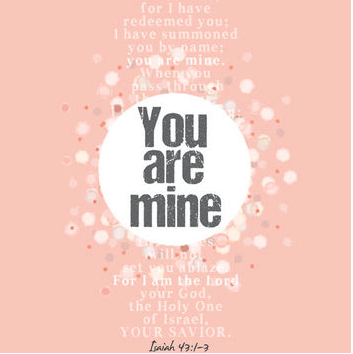 Not only do they belong to him, not only are they chosen by Him, not only does He promise to be with them in every situation, but here He declares they are precious to Him, they are honoured in His sight and He loves them. Just in case they need a little bit of extra proof of His affection towards them, He reminds them of what He was willing to do in order to secure them – “others were given in exchange for you. I traded their lives for yours.” We use the word ‘love’ very loosely. It can simply be a nice sentiment – “lots of love” at the end of a text, or “with much love on Mother’s Day” printed in 1000’s of greetings cards . We use it to describe how we feel about our favourite band, TV programme, take away food, or pair of comfy jeans. This is not the kind of love that God is talking about. His love, is a love that stirs Him to action. The sort of love that allows Him to demonstrate to Israel, just how far He was willing to go in order to protect them, to spare them and to rescue them. This is my favourite verse because it’s a picture of what God did in sending Jesus. Love is not a word that God throws around loosely and causally, in the way that we do. In fact, love is not ‘just a word’, for God. For God, love is action. I like to read it like this – “Jesus was given in exchange for you. I traded His life for yours, because you are precious to me. You are honoured, and I love you.” God longed to express to Israel how much they meant to Him. In Jesus, God demonstrates to all of us, just how far His love goes. I imagine, that as Israel heard those words, their hearts were comforted, their hope restored and their faith rekindled. I imagine it that way, because when I stop to think, that the deep affection God has for you and me, could only truly be expressed in sending Jesus to die in our place, that’s exactly what it does for me. Despite how hard I have found adjusting to becoming a mum, the truth of that has comforted my heart, has restored my hope and rekindled my faith. Perhaps this morning you are not “feeling the love” from those around you, that you deserve. Maybe you feel insignificant or overlooked, on what everyone seems to call a special day. Allow me to remind you this morning, that the God of the Universe says you mean so much Him, that you are so highly honoured, so powerfully loved, that He was willing to send Jesus, in your place – to trade His life for yours. Even on the most difficult of days, even on the most special of days, even on Mother’s Day, the truth of that love, demonstrated in such drastic action, is hard to ignore. These past 18 months have transformed my life and have transformed my faith – I have no doubt God will continue to teach me and stretch me, and will probably use Reuben to do it! I have tried to share honestly some of the struggles I’ve faced. We are very thankful, to God, for blessing us with Reuben and making us a family of 3. Perhaps you cherish the opportunity to celebrate with your mum and thank her for all she has done. Maybe you get to enjoy being celebrated, and have opened thoughtful cards and gifts before you arrived at church. On the other hand, today might be a day when you reminisce over old memories of time spent with your mum. Or the sentiment of today, might just pass you by and you’re happy to avoid the hype of it all. Or it could be a day you struggle with, and are glad to get passed, as it doesn’t hold the same positive significance for you, as it does for others. While I don’t know where you are today, God does. However you feel, whatever you circumstances, I believe that God’s words to Israel are true for all of us today, they are true for you today: This morning, God reminds you that no matter what anyone else might think of you; no matter whether you receive a Mother’s Days card/gift; no matter what you might feel about yourself, no matter whether you’re male or female… that you belong to him. He knows you by name, He called you, He created you and He has chosen you – nothing and no-one can change that. Nothing and no-one can top that. Not even the date on our calendars that declares this to be “Mother’s Day”! This morning, God promises, that no matter what season, or circumstance, of life you are in, He is with you – you are not alone. He has not left you or forgotten about you. Even though you might not see him, He is there. And finally this morning God declares just how valuable you are to Him. The love of others can come and go, we often choose to demonstrate it on special occasions, perhaps like Mother’s Day. God’s love for you is forever. 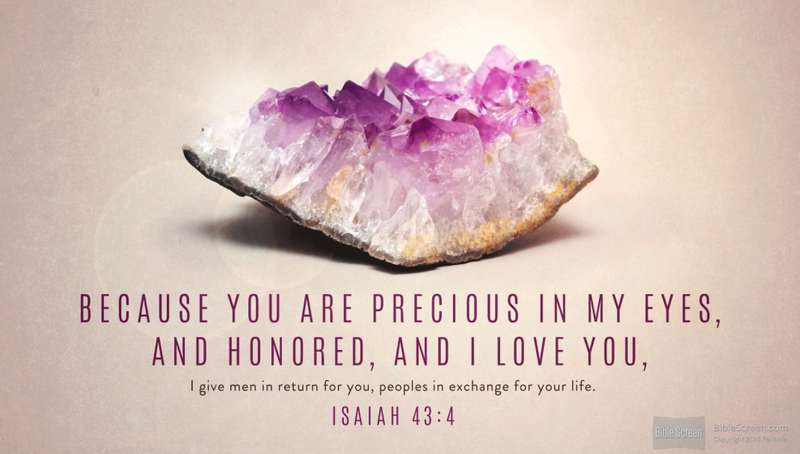 You are so precious and valuable that He exchanged Jesus’ life, for yours. That’s how much you mean to Him. You are not insignificant, your are not forgotten, far from it – you are honoured and loved by a God who choose to die for you, rather than be apart from you. A God who has demonstrated His everlasting love, in sending Jesus, in order to secure a forever relationship with you.